Ian Hook, Sydney 05/02, BSA sales, Now DEAD. Ian Hook, Sydney, 05/04, BSA show entry. Ian Hook, Sydney, 10/06. Reprinted in BSSA Bromgaz 41/04 Oct/Nov 2017. 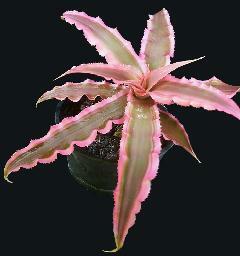 Cryptanthus `It' had a meteoric rise to prominence in the plant world of the late 1960s. 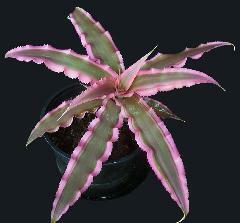 For many it was the only bromeliad they knew. It is, of course, a mutation. The all green form was brought into this country by Mulford Foster, collection number 2466, from its home on the Monte de Burro range near Bahia Brazil in 1948. Robert Wilson of Fantastic Gardens in Miami obtained a specimen; and, at his nursery around 1964, it sported so as to bear a broad band of shocking pink at the leaf edges. This reduction of the green area reduces the amount of photosynthesis taking place so that the plant is slow to reach maturity which may result in a plant of 18 inches up to nearly 2 feet across. 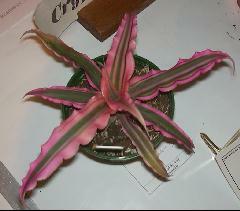 E.C.Hummel acquired a plant from Bob Wilson with whom he did a great deal of trading. Since it was in such great demand he (as did Horace Anderson also) had it tissue cultured. This technique at that time was in its infancy and was very likely done by Dr. Murashiga at the UC Riverside campus since Murashiga was the leading practitioner of this technique. 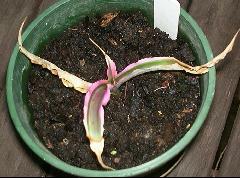 It was, in the case of Cryptanthus `It' a questionable success since the fee was quite steep. Of course, if it were a complete success there was great profit to be made. In this instance the majority of the resultant plants did not resemble Cryptanthus `It', but were a solid green, many were albino, a small number were carbon copies of Cryptanthus `It' and some had the color patterns of `It' reversed. It was clever of someone to invert the spelling of `It' to `Ti' which name this form is almost universally known; however, Hummel named the selection Cryptanthus `Minnie Belle', which name for purists has priority. Subsequently, Hummel listed it as C. `Ti' also. 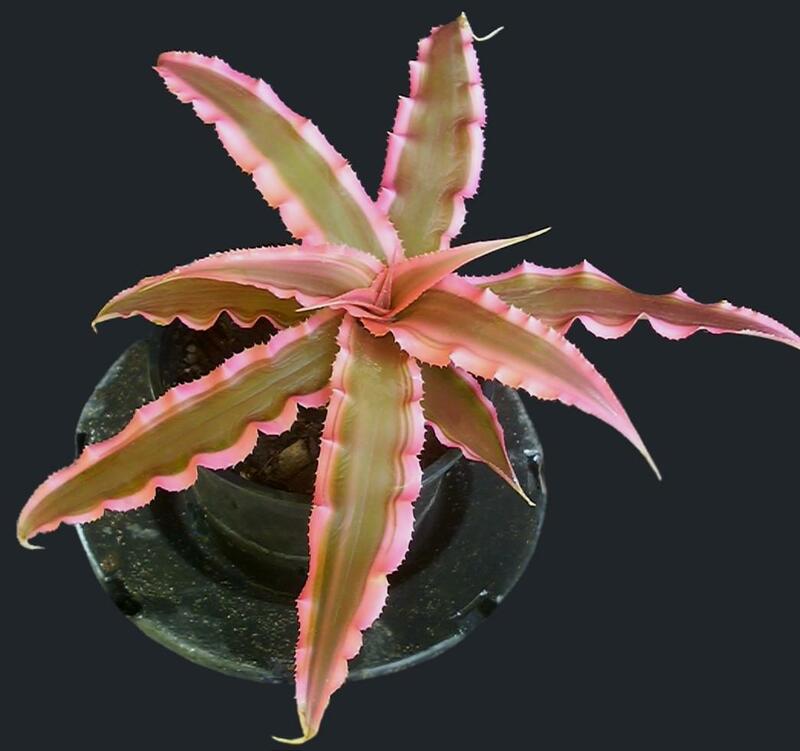 The tissue cultured plants that did duplicate Cryptanthus `It' proved to be highly unstable so that on a single mature plant and all at the same time would bear offsets some of which were all green, others were albino, as well as those colored like C. `It' and C. `Ti'.